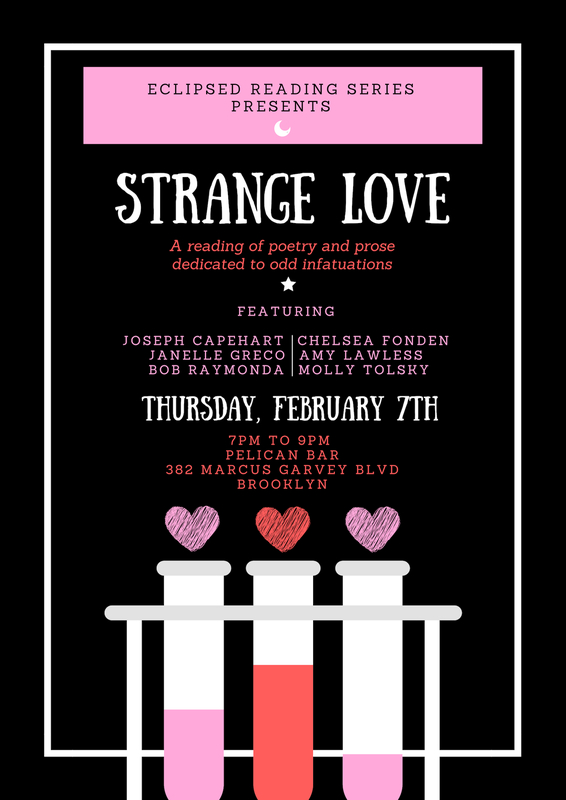 Join us on Thursday, Feb. 7 from 7-9pm for Eclipsed Reading Series’ 2nd annual Anti-Valentine’s Day Reading: Strange Love. Expect poems and stories of bizarre attachments and odd infatuations from awesome local writers Amy Lawless, Bob Raymonda, Molly Tolsky, and Joseph Capehart. There’ll be happy hour drink specials; $4 empanadas; and interactive activities (think: crowd-sourcing absurd love notes), hosted by the actual most-est duo: Chelsea Fonden & Janelle Greco. Writers & non-writers alike are welcome to help us celebrate Strange Love!